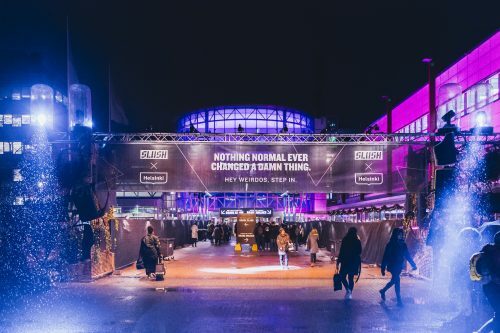 Weirdos Welcomed – Slush 2017 Is Officially Open! With 2,600 startups, 1,500 venture capitalists, 600 journalists from over 130 countries and 2,400 volunteers, Slush 2017 has officially kicked off. As the theme this year discusses how entrepreneurship can solve the biggest problems of the world, the opening show was also something never seen before. The narrative of Slush 2017 balances between utopia and phobia, the venue design being a perfect realization of that where utopia glows in pink and orange depicts phobia. Noah Kin, View and Huoratron literally gave voices to this mixture – Noah representing utopia and View phobia, in a show which was a continuation of the teaser released before. In the show, both utopia and phobia were mixed into a message, to call for all the solvers out there. Since Finland is celebrating its 100 years of independence, there also needs to be a proper gift, right? As a gift, Marianne Vikkula and Ilkka Paananen, the CEO of Supercell, gave a video introducing the #bragforfinland campaign, to encourage both Finland and the whole world, to brag for our usually so modest country. We’re all here for making the world a bit better place. Sometimes changing the world might sound weird, but hey, remember, nothing normal ever changed a damn thing. If you’re not at the venue, open our live stream, and enjoy the Slush 2017!